Nocton Hall is an RAF deserted hospital it was built in 1940 but wasn’t used as it was too small for an RAF hospital. In 1945 it was chosen as the local RAF Hospital for Lincolnshire (England) and gained several new buildings before opening in in 1947. By 1983 the hospital was closed and then leased to the army for the Gulf War in 1984, 35 patients were treated there during that time. In 1994 it was officially shut down and has stood empty since 1995. A grey lady has been said to roam the halls of the building and the RAF hospital grounds are said to be haunted by the patients. It seems less likely as it was not used for a particularly long time and there were few deaths on the site. The main ghost legend attached to Nocton Hall seems to hold a fairly stereotypical type of history. That doesn’t mean I’ve put my ban-hammer on the idea, just that it seems frequent these types come up at large old homes and hospitals. Nocton Hall had a sobbing ghost before it burnt down, the listed ruins then housed the RAF Hospital. The ghost of a young woman guests were sometimes awoken at 4.30am to see her stood at the end of the bed. She sobbed and mumbled incoherently about a ‘develish man’ and legend has it she was a servant girl who got pregnant by the owner’s son. This did not sit well with the young man so he disposed of her. Lucedio Abbey, located near Trino, north-west Italy was founded in 1124, and one of the earliest Cistercian monasteries in Italy. The abbey was secularised in 1784, and today the abbey buildings are part of a nice farm. There is restoration work being undertaken according to wikipedia so that could be promising for aspiring future visitors. It is said to be cursed by the monks that once resided there. In 1684 many young girls were said to have been visited by the devil in their dreams, he sent them to the abbey and they corrupted the monks into satanism. A history of torture and abuse became so notorious that it reached Pope Pio VI in Rome and the abbey was closed. It is said that in one room of the abbey a pillar gets wet, some believe it is crying due to the horrific experiences of the past. It could just be a leak… just saying. An evil presence is said to be buried under the crypt, guardians there had to sit around in a circle. The abbots that died were buried in a circle around it and they naturally appeared to have mummified around that way. 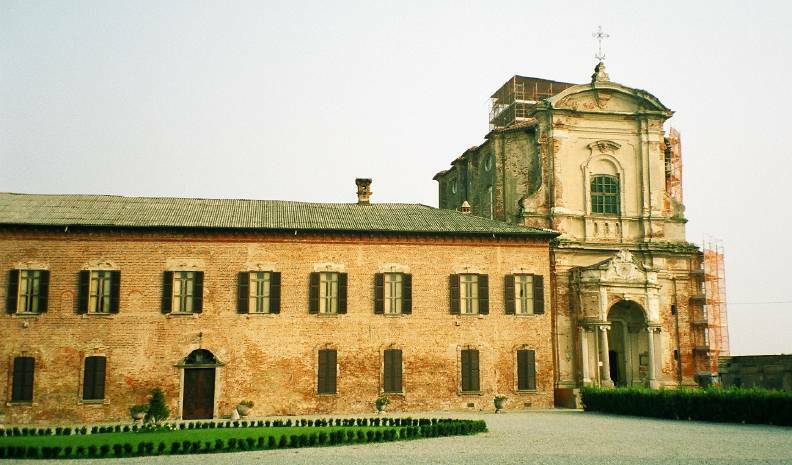 “Lucedio Abbey” by Original uploader was Georgius LXXXIX at it.wikipedia – Originally from it.wikipedia; description page is/was here.. Licensed under CC BY-SA 3.0 via Wikimedia Commons.